I have always wanted to see a jaguar in its natural habitat, but had resigned myself to the reality that it wasn’t going to happen in Costa Rica. From the moment I heard of the Pantanal, the best jaguar viewing location in the world, it became number one on my bucket list, and it finally came to be. With an area of 355,000 square kilometers, a little over seven times the land area of Costa Rica, the Pantanal is the largest wetland in the world. Parts of it are found in Argentina, Paraguay, Bolivia, and the largest portion in Brazil. In August of 2018 my daughter Natalie, and I spent eight days in the Pantanal National Park. It was definitely the most incredible eight days of my entire life. Our main reason for going was to see jaguars, but we also had giant anteaters, giant river otters, tapirs, and capybaras on our wish list. We saw more than we had ever imagined: fifteen jaguars, two giant anteaters, nine families of giant river otters, five tapirs, approximately 200 capybaras, 3000 to 5000 black caimans, and 128 species of birds including about 200 jabiru storks. Though the wildlife was amazing I was a little disappointed in the ecosystem. I am used to the incredibly biodiverse tropical rainforests of Costa Rica. In contrast the Pantanal forest was short, not very thick, and severely fragmented. Most of the land area was covered with huge cattle ranches, some in excess of 50 thousand hectares. Though these all had some forest it was found in isolated parcels separated by pasture. During the rainy season a large percentage of the pastures were flooded. In the dry season, when we were there, there were ponds and lagoons everywhere scattered across the ranches. The level of the Cuiabá River where we found the jaguars was three to four meters below the high water mark which was visible on the tree trunks. There is a narrow strip of gallery forest along the river, and this is where the jaguars are concentrated. Their main source of food is black caimans which are so plentiful that the big cats have no trouble finding food and, as a result, are so fat they look almost like well-fed zoo animals. 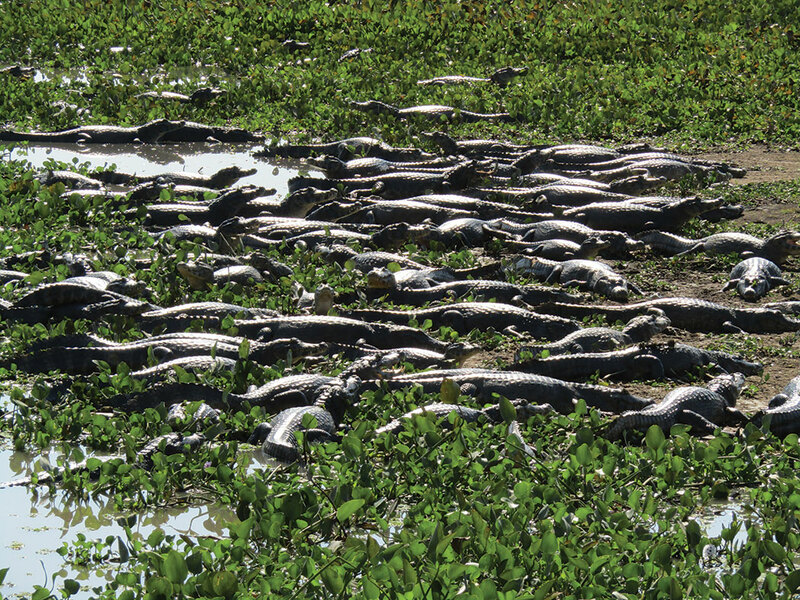 The river is full of fish which the caimans eat, and the jaguars eat the caimans. 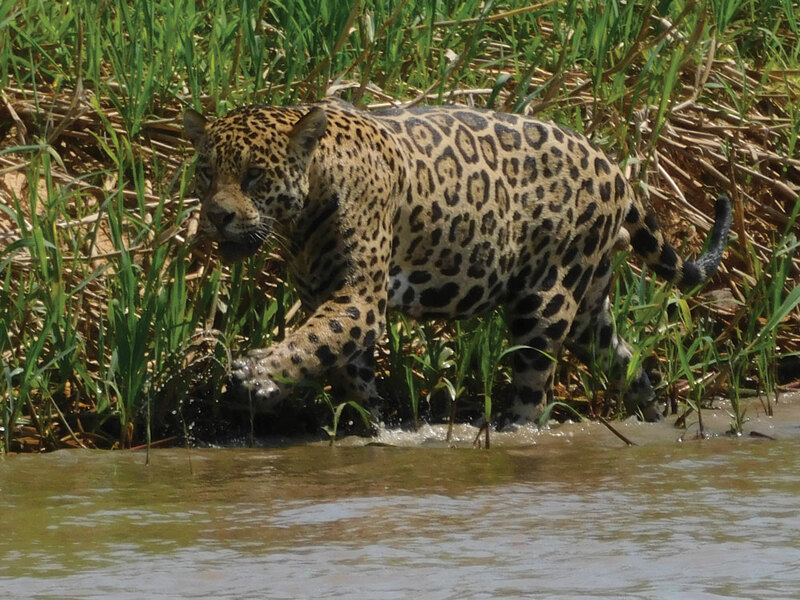 The biggest fittest jaguars naturally claim the territory along the river. The others disperse into the forest fragments scattered within the cattle ranches. 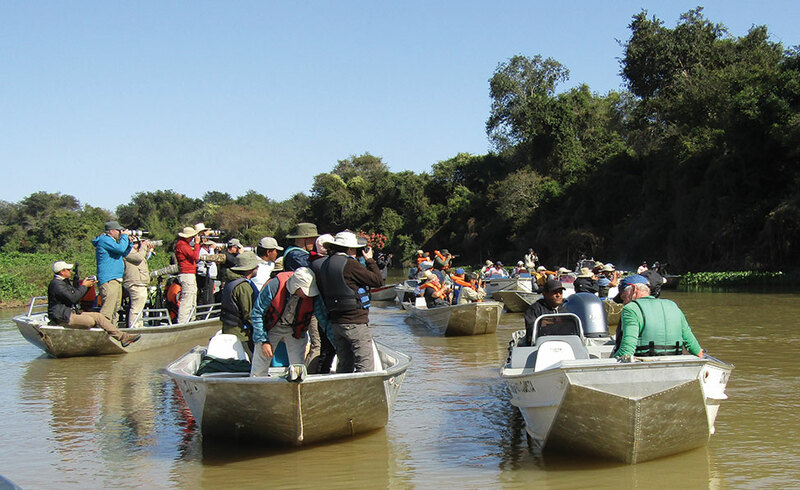 Boats with outboard motors move up and down the river and its tributaries in search of jaguars. The unwritten rule among the boat pilots is that whoever sights the jaguar has it all to themselves for 10 minutes, then they radio to the other boats. Out of fourteen sightings we discovered the jaguar ourselves, without the assistance of other boats, on only two occasions. It isn’t unusual to see 12 to 15 boats full of tourists most of whom are holding cameras with enormous lenses that probably cost more than my entire trip. Natalie and I weren’t envious though. We got some excellent photos with our little point and shoot cameras. The jaguars are used to the boats and don’t pay much attention to them. Three of the ones we saw lay down and went to sleep. Two of them swam across the river. We witnessed two caiman kills. In spite of all the excitement of seeing jaguars we always stopped to watch the giant river otters. Like the caimans they eat mostly fish. Unlike the caimans the jaguars have great respect for the sharp teeth and vicious nature of the otters and keep their distance. 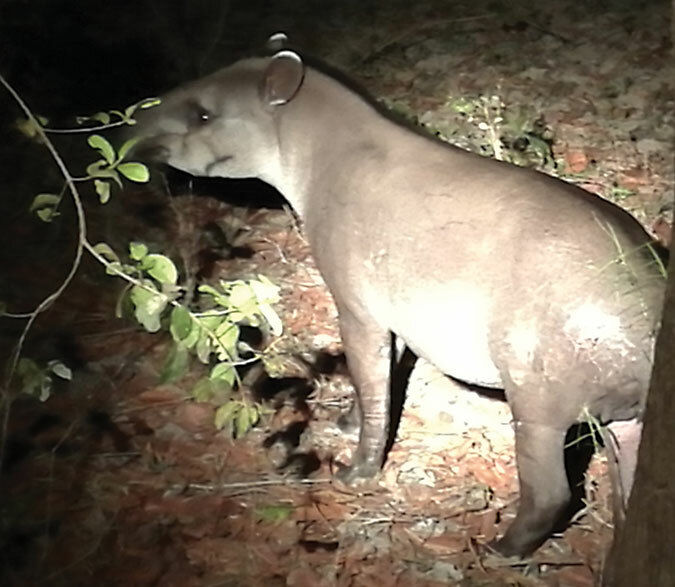 Jaguars also prey on capybaras, the largest rodents in the world, weighing as much as 65 kilos. The river was a treasure trove of birds and animals. After four days on the river we moved about 100 km inland to a large cattle ranch that also had an Eco lodge. 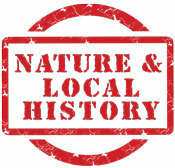 Many ranchers now cater to ecological tourism, which has been good for the area. It provides employment for the local communities, extra income for the ranchers, and provides a big incentive to protect the wildlife. 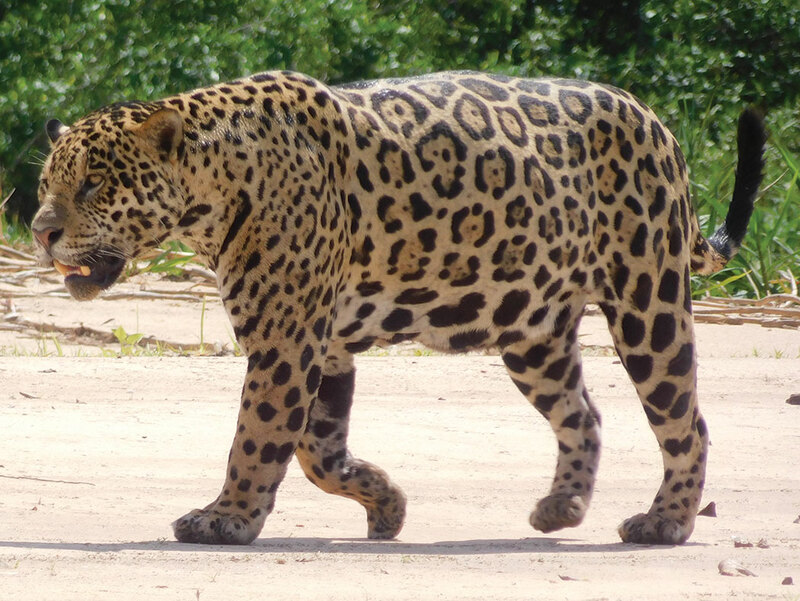 Ranchers used to kill every jaguar they saw. Now that they have seen how foreign visitors flock to the national park to see these impressive spotted felines most of them consider that a few head of cattle lost to the big cats is a small price to pay for the additional income they receive from the tourists. On the ranch we saw the giant anteaters, tapirs, three species of deer, lots of birds and three species of monkeys—Brazilian howler monkeys, brown capuchin monkeys and marmosets. They were few and far between and almost looked out of place in the sparse forests. There are no sloths in the Pantanal. The Brazilians have in the Pantanal National Park a unique product that attracts people from all over the world, but they could learn a lot from Costa Rica about how to show that product to the visitors. Our guide was excellent, but many of the boats full of foreign tourists had only a pilot who spoke only Portuguese. Our pilot, Edison, spoke Portuguese and a tiny bit of Spanish, yet he normally took groups of foreign visitors without the assistance of another guide. The pilots could find the jaguars but couldn’t answer questions, identify birds, or explain about the ecosystem. We were very pleased to have our guide Roberto who was very knowledgeable about the Pantanal and its wildlife and spoke both English and Spanish. Natalie and I and Roberto, were the only people I saw with binoculars, and we were very happy that we had them. A spotting scope would have been nice on the ranch where we did a lot of hiking, but we never saw one in the Pantanal. We did see a birding guide with one in the Chapada National Park where we stayed the last three days of the trip. In Costa Rica a guide without a spotting scope wouldn’t get many return customers. I believe the Pantanal ecotourism sector could learn a great deal from Costa Rica. 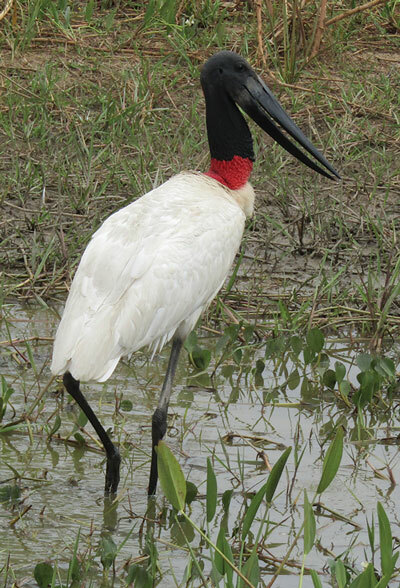 I am extremely pleased to have had the good fortune to visit the Pantanal. It is an experience I will always treasure. But I would never trade it for Costa Rica with its tall, dense, biodiverse forests full of all kinds of wildlife and birds, lush vegetation and enormous trees. It was so wonderful to be back home at Hacienda Barú where I could see a sloth almost anytime my heart desired.